It has been a crushing day of losses for the U.S. dollar. The greenback shed more 1.7% and in many cases close to 2% of its value against all of the major currencies. The magnitude of today’s decline is what we would expect from a central bank rate decision or non-farm payrolls and not from a day with only ADP and non-manufacturing ISM scheduled for release. 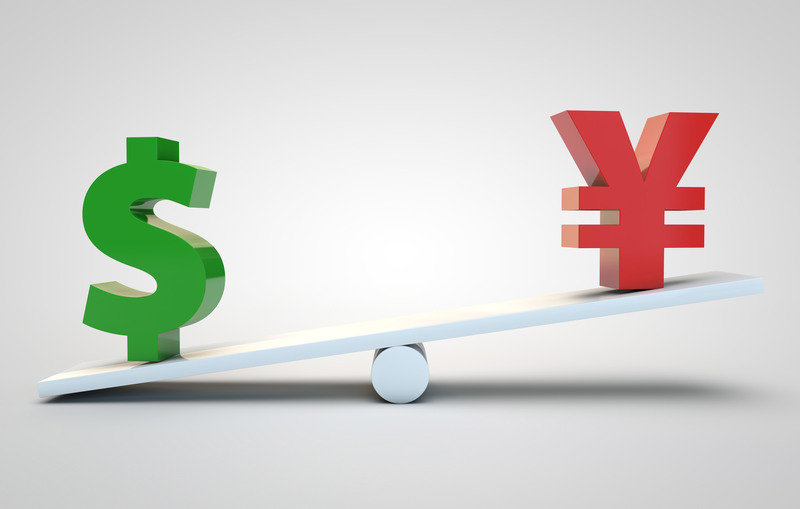 Of course the reason why the dollar experienced such steep losses is because Fed President and FOMC voter Dudley said market turmoil may alter the Fed’s growth outlook and that financial conditions are considerably tighter now than in December. His comments overshadowed the ADP report and set off the initial round of dollar weakness. When the ISM non-manufacturing numbers printed lower, the dollar tripped stops and shot to new highs versus many of the major currencies. Dudley’s comments and the ISM report are a wakeup call to investors who may have been distracted by easing abroad. The volatility in the financial markets, decline in commodity prices and weakness in parts of the U.S. economy is beginning to shake the Fed’s confidence. U.S. policymakers are growing worried and are starting to prepare the market for the chance of no rate hike in March. While his comments diverge with the more relaxed attitude of FOMC voter George who said earlier this week that the recent market volatility is not “necessarily worrisome” or Vice Chair Fischer who sounded more noncommittal. He said the Fed doesn’t know what the impact of volatility is on the U.S. economy at this point because while inflation will likely remain low for somewhat longer, similar volatility in the past left little imprint. 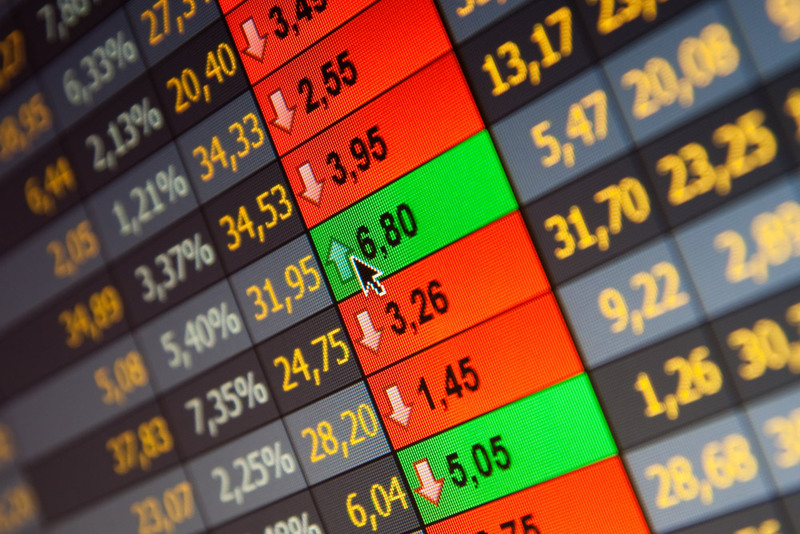 The bottom line is that everyone is somewhat worried and are watching the financial markets closely. So at this stage the bar has increased for non-farm payrolls and the March FOMC meeting. After today’s moves the near term outlook for the dollar isn’t bright. The employment component of the non-manufacturing ISM index, which is one of our favorite leading indicators for non-farm payrolls dropped to a 1 year low and the last time payrolls dropped this much was in January 2015 and that month non-farm payrolls growth slowed to 201k from 329k. Weaker job growth is certainly expected after last month’s strong rise but if softer payrolls is combined with lower wage growth then the dollar is really in trouble. However after such a strong move, a relief rally is not unusual and expected especially ahead of such an important event risk such as non-farm payrolls. USD/JPY completely erased its BoJ gains and now appears poised for a move towards 116. The decline in the dollar today also drove commodity prices sharply higher. Oil shot up close to 6% despite a massive buildup in oil inventories. According to the Energy Information Administration, crude inventories rose by 7.8 million barrels, significantly more than the market’s 4.8 million forecast. Normally this would be very negative for oil prices and the Canadian dollar but because oil is priced in dollars, the commodity and the currency enjoyed strong gains. However once the dust settles, we believe oil traders will wake up to the change in inventories and the prospect of additional Iran output and send oil prices lower. 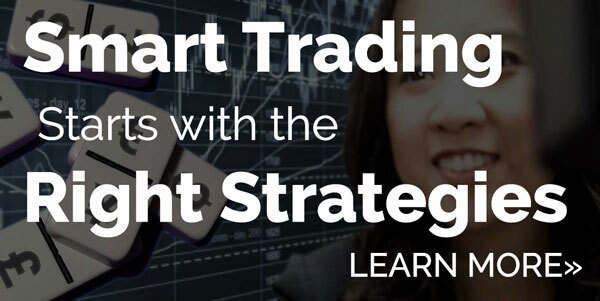 In the meantime, watch how USD/CAD trades around 1.3800, because it is a very important support level for the pair. 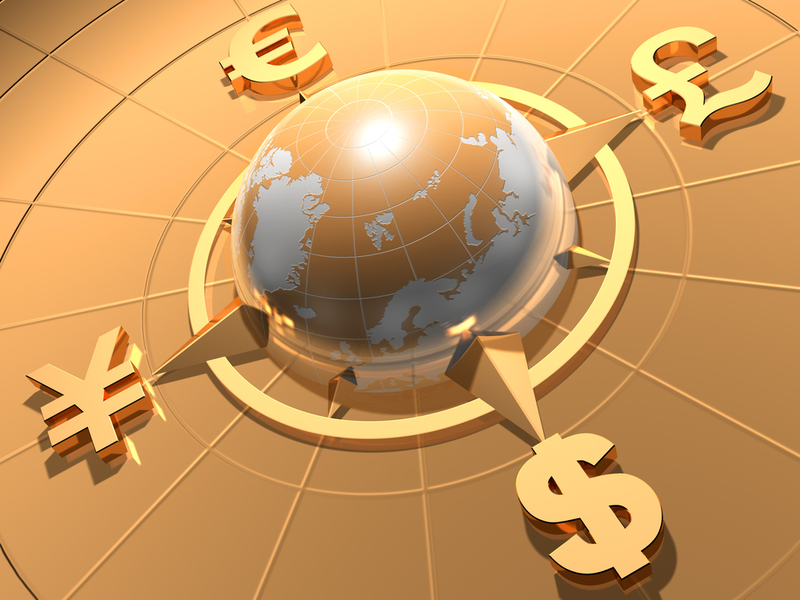 The 2% rally in the Euro was nothing more than a function of U.S. dollar weakness because the latest economic reports were right in line with expectations. 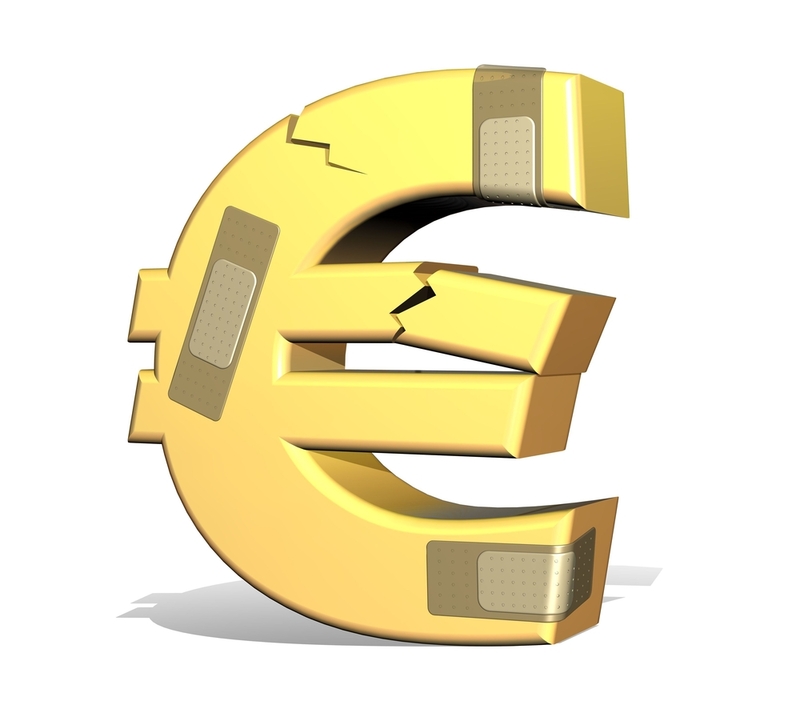 Today’s move has taken EUR/USD above the 200-day SMA and there’s no major resistance until 1.12. Sterling on the other hand enjoyed strong gains on the back of better than expected economic data. Service sector activity accelerated in the month of January and when combined with the rise in the manufacturing PMI index, lifted the overall composite index higher. This is important going into tomorrow’s Bank of England meeting and Quarterly inflation report. 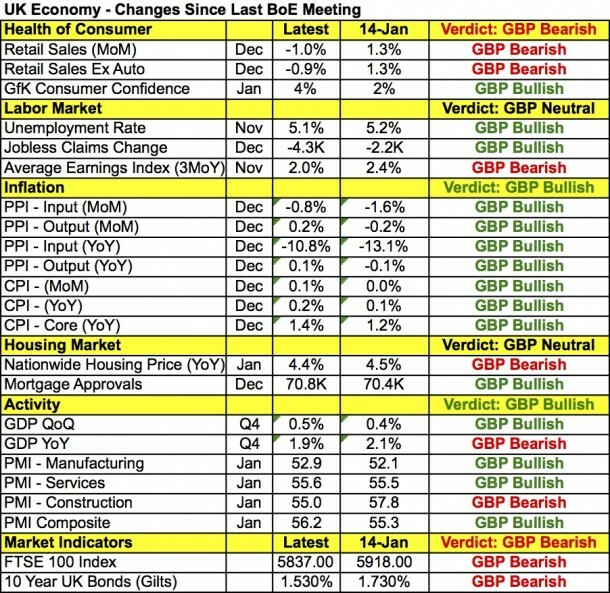 Taking a look at the table below, there’s actually been a lot more improvement than deterioration in the U.K. economy since the last monetary policy meeting. Aside from the PMIs, inflation also increased, the unemployment rate declined and consumer confidence ticked higher. 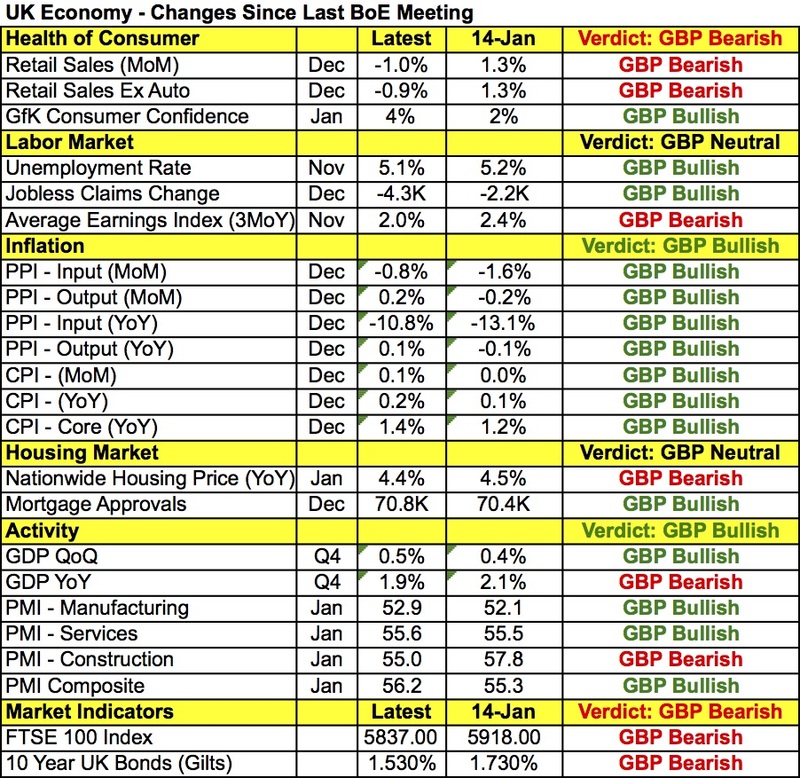 On the basis of data alone, the BoE has no reasons to grow more dovish but earlier this month Bank of England Governor Carney expressed concerns about inflation and growth and his sentiment could be reflected in the Quarterly Inflation Report. This report also looks back beyond 1 month and if we take a 3 month perspective, conditions have certainly weakened and lower forecasts are necessary. This makes tomorrow’s rate decision difficult to forecast and best traded reactively. Finally the best performing currency today was the New Zealand dollar, which soared close to 3% versus the greenback. Despite the sharp drop in dairy prices, New Zealand’s employment report blew out expectations with the jobless rate dropping to 5.3% from 6%. Economists were looking for an increase and the decline caught everyone by surprise. There was underlying weakness with the participation rate falling and wage growth slowing but NZD managed to shrug off the weakness because while RBNZ Governor Wheeler warned that rates could be lowered further he was not as dovish as the market anticipated following recent dairy auctions. 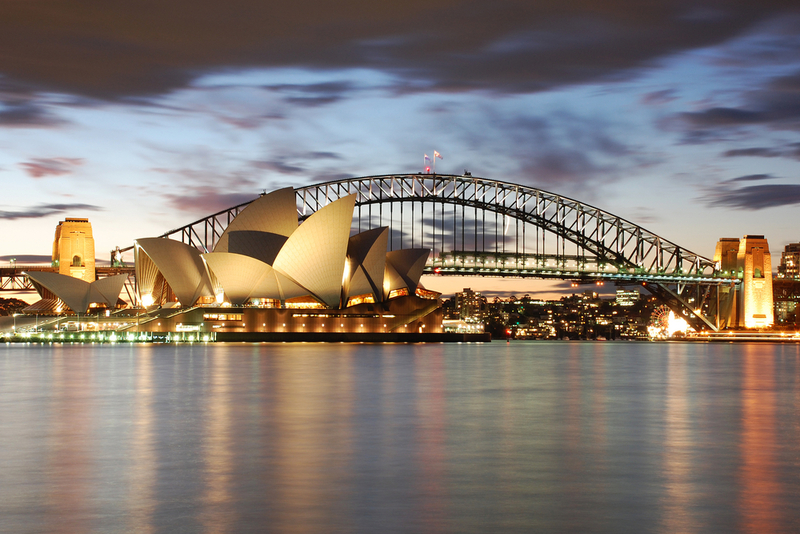 The Australian dollar also rose strongly versus the greenback on the back of stronger service sector activity, jump in building approvals and better than expected Chinese data.